Software provider Stakelogic uses as its theme Ancient Egypt and the illustrious ruler Cleopatra in this release. In the Book of Cleopatra video slot, you go in search of ancient hidden treasure in the marvelous pyramids of Egypt. The background music suits the theme very well, and the graphics have been kept simple and tight. It is up to you to spin the right combinations on the colourful reels and to create Big Wins or even Mega Wins. This is possible with the scatter Wild symbols and the Expanding special symbols in the game. 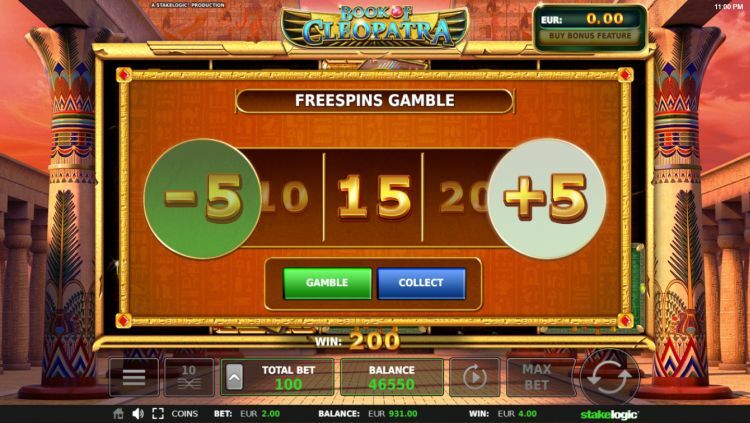 The Free Spin bonus game in the Book of Cleopatra slot has extraordinary features that we will revisit in depth a little later. Are you ready to discover what Book of Cleopatra can yield to you? Step into the world of Pharaos and hidden treasure. Embrace the mystique! 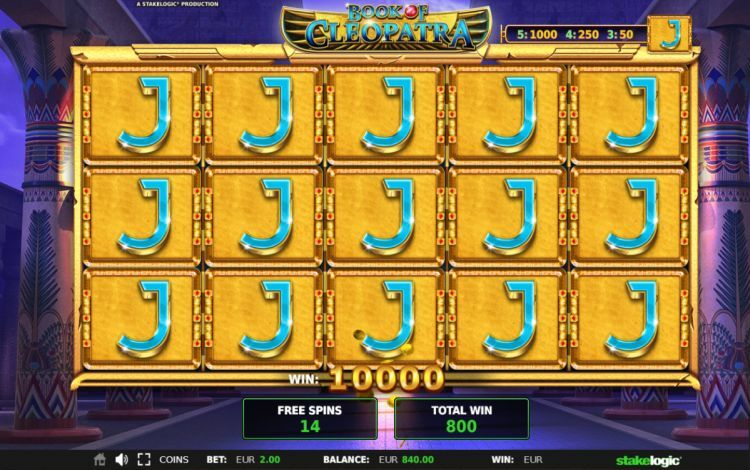 How does the Book of Cleopatra slot work? The playing field of the Book of Cleopatra slot is situated directly in front of the palace of the legendary ruler Cleopatra. The game is played on the standard 5 reels and 3 rows with symbols that relate to the Ancient Egypt theme. It has 10 fixed paylines upon which you have to attempt to make winning combinations from left to right. A winning combination occurs when there is a minimum of 2 the same symbols on the reels. You choose the coin value you want to play with. Your choices range between $€ 0.01 up to $€ 0.50, per coin. This translates as the minimum bet being $€ 0.10 and the maximum $€ 50, per spin. The theoretical payout rate at 96.21% is above the average for an online video slot, so that great. The variance of the game is high. In the primary game, you will find a total of 4 high-value symbols: Cleopatra, the Pharaoh, the cat-like statuette and the symbol with the bird. The symbol of Cleopatra is the highest value symbol in the primary game. 5-of-a-kind of this premium figure will earn you 500 x your total bet. The symbol of the Pharaoh is worth 200 x your total bet with 5 identical ones. The cat-like statuette symbol and the bird symbol will pay out 75 x your total bet if you manage to spin 5 the same on an active payline. These 2 symbols are also the only ones that will get you a prize when 2 of them appear on the reels. The low-value symbols are the well-worn card symbols: 10, J, Q, K and A. the maximum return on these is 15 x your total bet, but you will need to spin 5 identical ones to get it. The Book of Cleopatra that is the key to this game serves as the Wild Scatter Symbol. It replaces all other symbols in the game and also triggers the Free Spin Bonus game. When you have managed to spin 3 or more Wild Scatter symbols and activated the bonus feature you get 10 free spins. It is also possible in this game to try and get extra free spins utilizing the gamble feature. Before the start of the Free Spin Bonus game, the Book of Cleopatra randomly chooses 1 of the symbols on the reels as the expanding special symbol. If you can make a winning combination with this Expanding symbol, it will automatically spread across the entire reel. The prize that a winning combination with the Expanding symbol can deliver goes up to 5,000 x your total bet. If you don’t want to wait till you spin 3 or more Wild Scatter symbols, you have the option to buy free spins. It will cost you 40 x your total bet. After you confirmed you want to buy the free spins at the top right-hand side of the screen, the Free Spins Bonus game will be activated automatically. 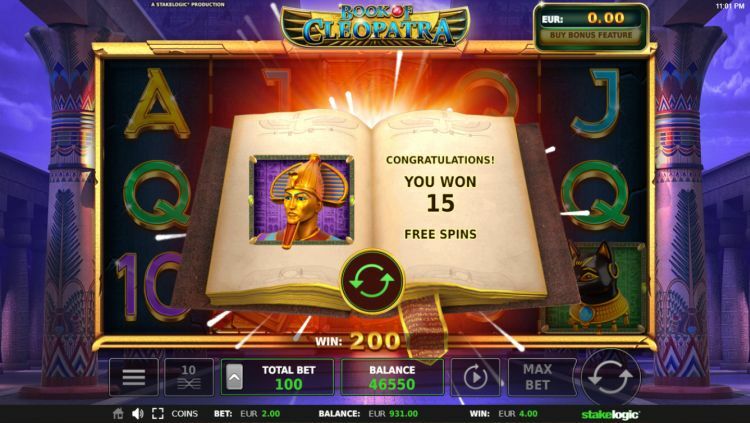 The Book of Cleopatra video slot is a solid game where some nice prize money can be won. It is and always will be a Book of Ra clone, but one where you have a Buy a Bonus feature. The truly big prizes occur mainly in the Free Spins Bonus game, and that is all because of the special expanding symbol function. The maximum take of 5,000 x your total bet during the free spins also remains a unique draw for serious gamblers. This, in combination with the payout rate of 96.21% makes it a very attractive proposition to play this game. Where can you find the Book of Cleopatra? 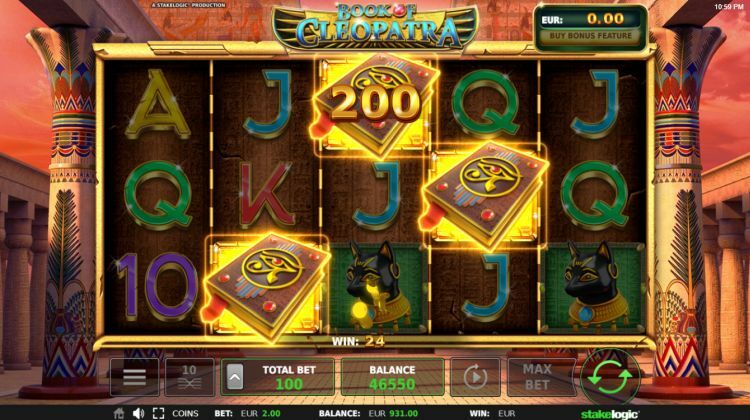 The Book of Cleopatra slot is found at all reliable Stakelogic casinos. One of these Stakelogic casinos is Slots Million, which is one of our favourite online casinos. You can play the Book of Cleopatra slot at Slots Million with a 100% bonus up to $€100 plus 100 free spins.